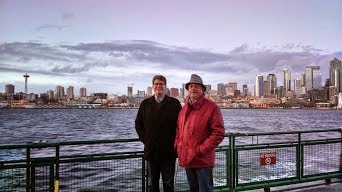 Al and Marco on the ferry to Bainbridge. Didn't this turn our good? Maybe because it was taken by a stranger. Will I ever finish planting Blue Star Creeper in those thousands of little holes? Maybe if I do one six-pack before breakfast I'll be rewarded with french toast. Maybe. Is 7:30 too early for chocolate? Easter Sunday was special because Marco came from San Francisco to play with us for the weekend. We drove the 30 miles up to Hurricane Ridge, where apparently they haven't gotten the word that it's spring. Really. That is the Dungeness Spit and we are just 1/3 mile inland from there. Looks like those dust spots have returned on the camera and I'll be sending it back again. Wah. Not good photography, but we stopped at Hama Hama oysters for just a little taste of fresh goodness. Creative use of garbage, isn't it? Al's job is finished with the turf stone on the new patio, but my job is just beginning. Will it ever grow full and pretty? Stay tuned. but I'm convinced it should be changed to the Dandelion Capital. From our dining room window. To the West from our front yard. Amazing what just one plant can do! They say that each dandelion is a wish - imagine the potential in our neighborhood. What will happen when these little devils go to seed? Beware! It's spring in Sequim! Well, it's Spring everywhere, just not exhibited in the same way in all parts of the country. If you haven't put your snow shovel away yet, I'm very sorry. It appears that they have changed drastically since I was living in winter country (1974, Chicago) but I'm not quite inspired enough to return. Just keep sending me pictures of the pretty days. No slush, please. We've had a pleasant but relatively quiet week. Just normal life. Sorry there isn't anything exciting to report. Al has been working on his garden project and the little fellas germinating in the greenhouse are adorable. I'll like them even better when they produce tomatoes that taste like tomatoes. Imagine! Look at this! Al put down his shovel long enough to pick up Pat and Rhett at the airport and have a weekend of fun. We started with the Naval Undersea Museum, which was full of information about subs and diving and sailors. Rhett is a former submariner and Pat is the daughter of one and the sister of another, so they were great sources of additional stories to go with what the Navy already knew. Friday we took the ferry to Victoria for a tour of the BC Parliament Building and a really good lunch. On the return trip we saw the biggest, brightest, longest lasting rainbow of all time. Okay,, of my time, but isn't it all about me? Well, isn't it? It appeared that the pot of gold would be right in our front yard, but apparently a passing vagabond must have discovered it before we got home. Sunday we drove to the edge of the continent to see Cape Flattery and were knocked over (I'm bottom heavy, so kind of tough to knock over, like those inflatable clowns when we were kids, but you know what I mean) with the surprise of seeing a herd of the Olympic Peninsula Roosevelt Elk. Named for Teddy Roosevelt, they only live in and near the Olympic Rainforest. You'll just have to do some research for more info. just by the seat of Tom Dually's pants) as we ventured back home. clouds, just for our viewing pleasure. We have been astonished every day as new plants come peeking up to announce Spring and welcome us to our new house. This little patch has daffodils, jonquils (does anybody know just what the difference is? I googled but it seems like everything is just a cousin in the same overpopulated family), hyacinth, some other pretty little blue things I don't know the name of, and now red tulips are joining the party.